The flu season had struck me hard before Christmas so sadly I missed the last two episodes and wasn’t able to review them in time. As the next part of Season 4 starts tonight I asked another Spoiler TV reviewer and Supergirl fan to share their views with me before it starts. Many Thanks to DJRiter for her contribution to this article. What can I say about the latest episodes of Supergirl and Season four it certainly has taken things higher on the political level and a narrative that certainly isn’t pulling any punches. We assumed the Red daughter would play a role, but she had appeared briefly, The Red Daughter who came from the black kryptonite battle with Supergirl and Reign at the end of Season three. 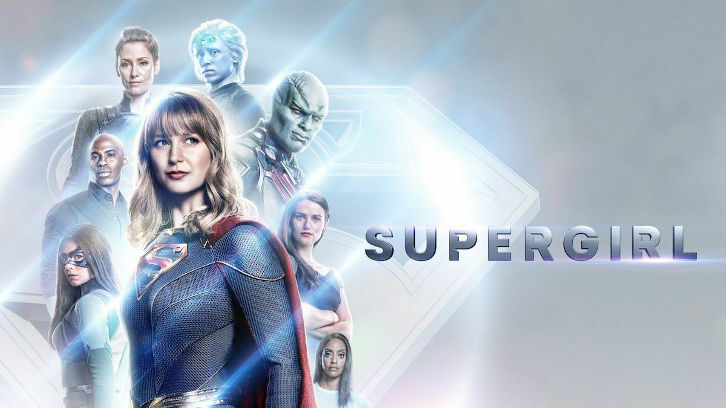 Season three was a rollercoaster and like many fans, I wanted much more from season 4 my one big problem is the lack of the Super in Supergirl, and the complete lack of her in the Elseworlds crossover (even in her own episode). While it can be argued there were power dampeners on the island in ‘Rather the Fallen Angel’ haven’t we been told red sun or Kryptonite is the only thing to stop them being super... this certainly must be some impressive tech to pinpoint each alien’s power weakness. Even in Elseworlds seems the meta prison can contain a super too so possibly the same Tech?? Getting back to the less than Super part we need her to be more of the Supergirl we know, she beat up her cousin for crying out loud. Thankfully she managed to get out of the island prison but her screaming for James help .. really a damsel in distress. No, we need a hero, not a damsel. So much about this whole plot point annoyed me. Thankfully her strength was proved in Bunker Hill, lifting the building while encased in nth metal was impressive. Unfortunately, it was left to her Cousin and Arrow to save the day in Elseworlds despite both her and Barry willing to sacrifice it all being the most powerful ones. Less beating up on the girl of steel would be appreciated and her being the star of her own show! In a world were young women and girls so desperately look for female role models in the snowstorm of their male counterparts can we a least having them being the heroes they should be. Supergirl was that show and needs to be that show. It doesn't always have to be about might and Kara returning to her reporter roots is another welcome return this season. Using the pen to achieve her goals. Every season has it big bad while Liberty has played a significant part so far this season, I am convinced he is it merely a pawn in a bigger game. Agent Liberty believes Earth is no place for Aliens, a normal man who through circumstance has let fear and hatred consume him. Taping in and exploiting the same in others until the Children of Liberty start to rise against the Aliens on earth. Giving what some might say Supergirl’s hardest opponent to fight. Another old foe to the Super's Lex Luthor has been cast and will appear later in the season, it is interesting to note how Lena’s journey may be taking a sinister turn as well this season. Her assistant is Ms Teschmacher after all. In ‘Rather the Fallen Angel’ Lena’s story was forefront and you almost forgot the Supergirl’s battle on the island as Lena tried to test the black kryptonite on a human subject. Her intentions are good, but could these actions lead Lena down a very dark path also causing a deeper rift with Supergirl. To aid Supergirl this season we have two new regulars’ Brainiac or Brainy as we know him from the future and a member of the legion. While we were introduced to Brainy last season, he has become the comic foil round the DEO since Winn’s departure. The other new addition is the wonderful Nia Nial, the young enthusiastic reporter, who is like looking at Kara 2.0 from Season One. Nia Nial has been a breath of fresh air so far this season and finally getting to the bottom of what is going on with her in the episode Bunker Hill was welcomed. I did think Brainy knows more but like he said it could mess up further events. It’s clear he likes Nia and their scenes together are adorable we have only had a brief glimpse of her back story and I can’t wait to see how it develops later in the season. Another guest star is Manchester Black who because of the actions of Agent liberty loses his fianceé. We got to learn that grief and hate come hand in hand as Manchester Black proves he isn’t the ally they believed him to be betraying J’onn as well as Supergirl for revenge. J’onn himself wanted revenge against the white Martians for 100’s of years for killing his loved ones. As J’onn left the DEO he made way for Agent Danvers to take the lead, but this seems short-lived given the current political climate as it was revealed the President was an Alien and the Vice President who took her place certainly seems to be throwing his weight around. Alex becoming Head of the DEO gave me hopes for a better Storyline for the character after the disastrous turn of events last season. Chyler deserves so much more as she gives her all in Alex. One episode ' Ahimsa' she clearly struggles with being in charge and protecting her sister and I feel more of that is to come. The Danvers sisters always will remain the heart of the show. So far this season Director Danvers seems to have her hands full with Colonel Haley. This makes you think, Alex really isn’t in charge of the DEO at all now. The President asking Supergirl to reveal her identity and his actions in the last episodes make you wonder if he is the guy on the other end of Liberty’s phone. After all, he had the most to gain and it is also clear Haley isn’t a fan of Aliens. Before the break, it ended with Supergirl looking so torn and she took a trip to the Kent farm for some advice from her Cousin. Let’s not forget Superman refused to work with the DEO a long time ago. Superman won’t be on hand to help as the storyline shows him and Lois returning to Argo to start their family. In a world where I feel we are going backwards instead of forward, we look to our TV scenes and our heroes. Liberty gaining followers with his extreme beliefs are scarily accurate and a sad sign of the times. Waiting in the wings we have Red daughter and Lex Luthor and I for one can’t wait to see how that unfolds. In preparing my thoughts for this article I went back and re-watched every episode of the first half of Supergirl's fourth season. And, reading comments and thoughts from others I have come to the conclusion that there are so many reasons people tune in to Supergirl. Some steeped in comic book knowledge look for the iconic Supergirl moments, some watch for the relationships, others watch in support of their favorite actors and there are those who watch who enjoy a well-told story and good acting. It is a monumental challenge for the writers and producers to please all these groups. In my opinion, the first half of Season Four of Supergirl has been among the strongest in the show's history. It has been my pleasure to watch this show grow, mature and come into its own and elevate itself in quality above many of its Arrowverse counterparts. This season the show chose to tackle a difficult and timely storyline that hits too close to home for some. For me, the show is to be commended for the way it has approached and handled the story. While the storyline and some episodes have been difficult for some to watch, the subject has been handled well and the show's storytelling has excelled. For all its growth, the strength of the first half of this season is a return to all the things that made fans fall in love with the show. It has taken the charm of Season 1, the heart of Season 2, the action of Season 3 and strong character growth to create a deeper, layered show. A quick look will show that all the things they've done right far outweigh the miscues along the way. The most important change is a return of focus upon the heart and foundation of the show, the Danvers Sisters relationship and the power of the "space family" of Kara, Alex and J'onn. All three of these characters has shown tremendous growth and are proving adept at handling the changes happening in their lives. Kara/Supergirl is growing on two fronts, first as Kara and becoming a mentor to a young reporter she has come to realize the impact Cat Grant made on her. Then, as Supergirl, faced perhaps with the biggest challenge of her life is learning how to fight best without using her physical powers. J'onn is struggling to follow in his father's footsteps. However, he is slowly finding a new path as a sort of alien private detective who fights to right the wrongs done to aliens. He's also showing a softer more paternal side to him in those wonderfully scripted scenes between J'onn and his space daughters. Now that J'onn and Supergirl both no longer work for the DEO, I would have no problem with Alex joining them and the three of them working together in a new agency. Any scenes with Melissa Benoist, David Harewood and Chyler Leigh this season have been golden and a perfect reminder that if the Danvers Sisters are the heart of the show the "Space Family" is its foundation. The character showing the greatest growth has been Alex. She's slowing evolving into the leader J'onn always knew she would be, even if it means exerting her authority over her sister as so beautifully illustrated in "Ahimsa". That episode was a showcase for Chyler Leigh and she more than lived up to the challenge. An issue of the past that the show is taking careful steps to correct is the careful development they are giving newer characters instead of rushing them into the show and the story. Jesse Rath has been a wonderful addition as Brainy, and his stumbling moments adjusting to life in our time have been delightful. Rath's comedic timing with Leigh in some of his encounters trying to please Director Danvers was great. Nicole Maines as Nia Nal, fledgeling reporter and superhero has been outstanding and watching her grow into her superhero persona and how Supergirl becomes a mentor is going to be a highlight for the rest of the season. Another great addition has been David Ajala as Manchester Black, he keeps adding layer upon layer of complexity to his intriguing character. And isn't it time the show made Andrea Brooks' Miss Tessmacher a recurring character? Her scenes in the lab working with the scientist side of Lena Luthor are fun to watch. One of the missed opportunities I think from the first half of the season was the too quick departure of the Graves siblings. I would have liked to have seen Mercy and Otis Graves hang around a little longer, providing a great contrast to the sibling relationship of the Danvers sisters. Perhaps the biggest miscue of the season gave us the show's greatest moment, I believe. Once again, those in charge of the traditional crossover episodes did a massive disservice to both the show Supergirl and its title character. Supergirl barely appeared in her own episode of the crossover. She didn't even get the final scene on her own episode. The most powerful thing to come out of the Supergirl episode of the Elseworlds crossover was a short but emotionally impactful scene between Supergirl and the Elseworlds version of her sister Alex. This scene is a showcase for two of the very best of the CW, Melissa Benoist, and Chyler Leigh. It is criminal how underrated and at times underappreciated these two incredible actresses are at playing these characters. This short scene was THE standout moment of an otherwise disappointing and lackluster crossover event if not one of the very best moments of the 2018 television season for me. The love and respect Kara has for her Earth 38 sister clearly shows, and you see her using her greatest super-power to reach out and connect with a somewhat jaded Earth 1 Alex. This scene illustrates, yet again, how powerful the bond is between both the Danvers Sisters and Benoist and Leigh. Promos and teaser interviews promise more great episodes to come from Supergirl upon its return tonight. Intriguing twists and challenges lay ahead, and I think when it is all said and done this will prove to be the show's strongest season yet. So, for whatever reason, you choose to watch Supergirl, stay tuned, trust the writers/showrunners and actors for the best is yet to come. So what are your thoughts on Season 4 so far ? What do ou hope to see in the cmoing weeks ?